Good day proud kitchen owner. Welcome to mission control. Your mission, should you choose to accept it, involves the exploitation of a small kitchen and the generation of additional storage space inside it. This is, of course, a majorly important issue that requires your full attention to detail. You may select any number of team members to support you on your mission, but it is essential you keep this information between yourselves. Seriously though, if you have a small fitted kitchen then you will know all too well the pain of running out of storage space. This is especially true if you have a large family to feed. Cluttered items can very quickly make your kitchen look an uncontrollable state and there’s nothing worse than cooking in a crowded environment. Not only does it look messy but it’s also quite hazardous too; you don’t want anyone tripping up and falling over. It is believed that we Brits will spend a total of three years in our kitchen – three years! That’s according to the Daily Mail, who has reported that we will spend 1,132 days in our lifetime slaving over a hot stove. That is a lot of time! So it is absolutely necessary that you keep on top of your cleaning and storage solutions to ensure your kitchen is as flawless as possible. It’s all about making space where you never thought possible before. These handy tips, as detailed below, will help you on your way. A kitchen with very limited shelf and cupboard space can be extremely frustrating at times, especially if you own a lot of kitchenware and utensils. Baking trays, cooling racks, muffin tins and chopping boards are all typically awkward items that just take up too much space! However, most people fail to realise that they do indeed have one great big hole they can store items like this inside – the oven! It’s such a simple solution but one that most of us never think about. Use your oven as extra storage space; just remember to take the items about before turning it on! Hooks are incredibly useful in a tight kitchen area as they can transform any wall or outside cupboard space into a handy storage solution. Regularly used items should be hooked as they can be reached easily and are handy to grab quickly. So hooking your tea towels or cooking utensils is a fantastic method of saving cupboard and drawer space. If you have space between the tops of your cabinets and your ceiling, why not slot your pots and pans in there? Alternatively, if you have the option to do so, why not hang them from the ceiling by using some of the above mentioned hooks? If you have the space above your head it only makes sense to utilise it. Try organising your kitchen belongings by how and when you use them. For example, items such as salt, pepper and perhaps napkins should be stored in an easy-to-reach place (maybe out in the open) as you use these items often. Other items, such as a tin opener or a fruit blender, are used less often and so it makes sense to store these away in a cupboard or a drawer. It will also save you a bit of time if you place your plates, cups and cutlery within easy reach of your dishwasher; so you don’t have to walk back and forth. Another organisational type piece of advice here but it is certainly very true. When cooking, you will find it saves you countless minutes and possibly hours over time if you clean up behind you as you move along. This is especially true in a small kitchen space as failure to clean on the move can result in a pile up of dirty dishes and other clutter. These things are extremely simple but genius nonetheless. If you own a nice chunky set of kitchen knives then buy yourself a nice knife block to house them. The handles on cooking knives can be quite thick, meaning they take up a considerable amount of space inside your drawers. Nevertheless, it is true that the knife block itself can be quite a space taker. So alternatively you can try a wall-mounted magnetic knife rack instead. Now these things really are cool! One of these bad boys will keep your entire kitchen tool collection (not just your knives) tucked out of the way but in easy reach too. When we say the insides of your cupboards we don’t mean the actual open space within them – that would be a pretty lame and obvious piece of advice. What we mean is the inside door panel where you can stick a magnetic panel or corkboard for notes and shopping lists etc. You can even fix some racking there if you have the space to close the door afterwards. Alternatively, you can introduce are friend Mr. Hook again! Make Use of the Fridge! Similar to the previous point, your fridge door can be utilised in much the same way as your cupboard doors and kitchen walls. Simply use magnets to hang notice boards, calendars or some racking for your spices and/or sauces. Incorporating a Lazy Susan within a corner cupboard is not only space-saving, but it’s also extremely helpful for your back and mind state! It’s pretty frustrating sifting through your cupboard junk, trying to claw to the back in order to find a sieve or measuring jug. A Lazy Susan allows you to simply spin your cupboard belongings round until you find what you are looking for; allowing you to stack things up neatly and in an organised fashion. Last but not least, the ultimate optical illusion, installing a mirror in your kitchen can provide the illusion of space and openness. Sometimes it’s not so much the storage space that is the problem, but more the feeling of confinement and claustrophobia. So using mirrors can alleviate that feeling and create a more open environment for you to enjoy. Using antiqued mirrored glass on cupboard doors particularly enlarges a small kitchen and even makes the room look lighter. Your mission has been briefed to you now agent, your training is complete. Remember, creating space in a small kitchen is a plausible mission, not an impossible one. The tips provided here are of course amateur pieces of advice that hardly compare to the expert space-saving knowledge of our illustrious team of kitchen fitters. 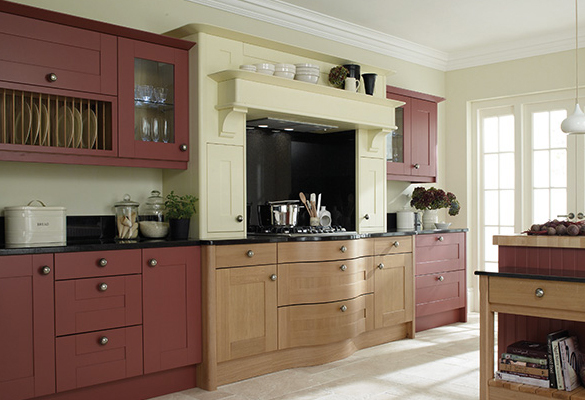 If you are searching for a new fitted kitchen in and around the Manchester area take a look at our extensive collection of luxurious kitchen designs. It doesn’t matter to us how big or small your kitchen space is; we have years’ worth of experience fitting dream kitchens of all shapes and sizes. Contact us today for more information, one of the squad will be more than happy to talk to you. In the meantime, we wish you the best of luck with your kitchen space-saving mission moving forward. Over and out.